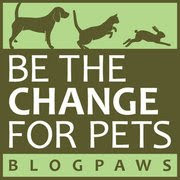 It's Adopt A Less-Adoptable Pet Week! 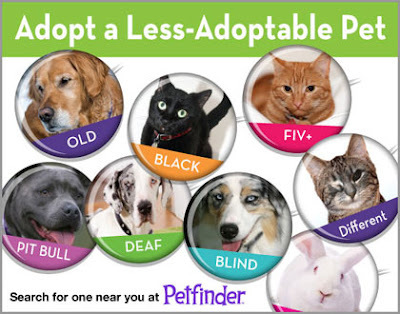 The good folks at Petfinder have pronounced this week...you guessed it: Adopt A Less-Adoptable Pet Week! We know that so many of our blogging friends already have opened their hearts and homes to what are called "Less Adoptables": Companion animals who have hit their senior years, have special needs, or just happen to be born black in color or of a breed that some have stereotyped, like Pit Bulls. And you're such good ambassadors for bucking the trends and demonstrating first-hand have much love these so called "Less Adoptables" have to give. But it remains true that among all the less adoptable animals, it's the senior dogs and cats that have the hardest time finding a new forever home. "...senior pets often spend the longest amount of time at the shelter before being adopted—but many do not get adopted at all...and have higher euthanasia rates or even live out their lives in a shelter kennel." Yes, there is the potential for higher veterinary costs when you adopt a senior pet, but there may not be, either. Disease and disabilities can strike younger pets, too, and the costs may balance out over the lifetime of care for a puppy or kitten. Check out this article from our friends at DogTime Media on how you can help the less adoptable pets in your community, even if you can't add a new family member right now. And while you're in the neighborhood, peruse these gorgeous "less adoptables" on PetFinder, just waiting for their forever home. Who knows, you just might fall in love. I've always thought there should be a better marketing campaign for senior pets. My Mom just lost her beloved dog and is concerned about getting another dog due to her age. I think a senior dog would be a great solution for both of them once she's past her grief. It's a win win situation. She gets a pet that needs a new home. With the right match the dog is going to be lower energy, but still want the walks that keep my Mom healthy and getting out in public. However, that is something that shelters need to be open to as well. Friends of ours went to adopt and there was a huge age bias when they went. They weren't looking to adopt a puppy which would be too high energy for an older couple. They wanted an older dog that would match their energy level. 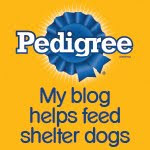 They were healthy and financially able to meet the needs of the dog. Yet the rescue rejected them because of their age. Bad move for the couple and the dog. Thanks for letting us know this—what a shame for both that couple and the dog. We're so sorry for your Mom's loss...I hope when her grief subsides, she will choose a senior pooch:-) Please let us know!